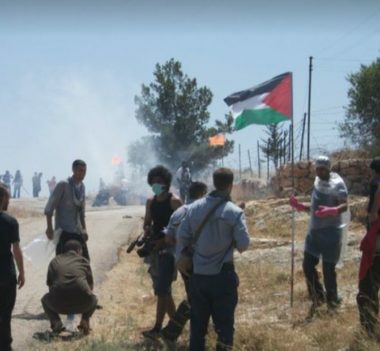 Israeli soldiers attacked, Friday, dozens of Palestinian, Israeli and international peace activists, participating in the weekly nonviolent procession against the illegal Annexation Wall and colonies in Bil’in village, west of the central West Bank city of Ramallah, causing many to suffer the effects o teargas inhalation. The protesters marched from the center of the village, carrying Palestinian flags while chanting for national unity, ongoing resistance against the illegal Israeli occupation, and its colonies, the release of all detainees, the liberation of Palestine and the return of all refugees. They also denounced the murder of Hamdi Taleb Sa’ada Na’san, 38, a father of four young children, who was killed, on January 26th, with a bullet to his back by a group of illegal Israeli colonialist settlers who invaded the northern part of the al-Mughayyir village, east of Ramallah. The Media Coordinator of the Popular Committee in Bil’in, Dr. Rateb Abu Rahma, said the Palestinians and their supporters will continue their struggle against this illegal occupation and its colonialist polices, despite the Israeli escalation. As the protesters reached Abu Lemon area, the soldiers started firing a barrage of gas bombs and concussion grenades at them, causing many to suffer the severe effects of teargas inhalation.